Like most people who come back from vacation, the characters on Supergirl spend this second half episode chasing the sunshine in its various forms. Kara seeks the satisfaction in helping people, Alex is basking in the glow of a new relationship, Winn just wants to stay in the truck and Jimmy’s foray into superherodom is still the worst part of the show. This episode, directed by Kevin Smith (you can tell because his daughter was the lead extra), was constructed like banana pudding: plot points layered with tangential social commentary about human trafficking, and the show’s signature brand of relentless optimism poured liberally over the top to fill in the cracks and bring it all together. Much like with that southern staple dessert, that much vanilla somehow makes the episode work. After hitting a malaise in both her professions, Kara is taken by the story of a girl who has gone missing, and believes finding her will make for a good story for Snapper, and help get her superhero groove back at the same time. Her investigation turns up a rash of missing persons cases in National City in recent days, and leads to a facility where Kara (with Mon-El in tow) meets up with an evil looking dude in a lab coat (played by James Urbaniak, who you might recognize as evil dude in a lab coat on Agent Carter, and the voice of Dr. Venture on Venture Bros.). Evil dudes in lab coats gotta evil and his brand of choice is pushing unsuspecting millennials through an interstellar gateway and selling them on the intergalactic black market as slaves. Roulette, from earlier this season, is also involved for no reason other than: who doesn’t like Dichen Lachman? Kara suits up and tells Mon-El to get help from Alex and the DEO. On the other side of the portal is a planet with a red sun, leaving Kara and Mon-El, who didn’t do as he was told, powerless. Just because Kara doesn’t have powers doesn’t mean she isn’t without hope. After getting purposely captured, she inspires the human captives to stage a revolt, and turn the tables on their captors and make an escape. While Kara is missing, Alex is freaking out and takes it out on her new relationship. 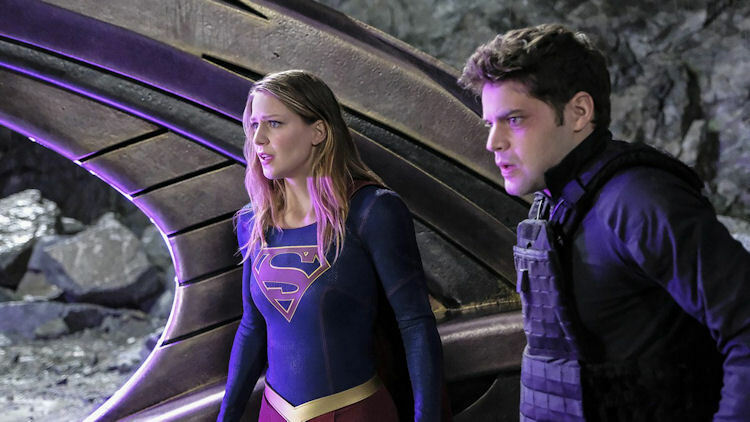 The DEO team tracks Kara’s whereabouts and discovers the portal. The atmosphere on this planet is poisonous to Martians, so Winn, freaked out by his bad experience moonlighting with Guardian, gets the call to join the rescue team. The rescue is aided by the fact that an alien from the crossover recognizes Mon El as royalty, and lets him pass unharmed. Of course it all works out in the end: Kara, assisted by a yellow sun flash-bang, helps a big group of people (and writes a story about it). Winn gets his groove back by being a badass on a distant planet, and Alex and Maggie strengthen their bond after Maggie figures out Kara’s alter ego. While there was nothing spectacular about this episode, you can’t help but appreciate the adorable fun. Kara and Mon-El have a great chemistry, and seeing Alex all giddy and practically dancing with happiness was a joy that rang true to reality. The stinger at the end promises more alien adventures to come, and it’s sure to deliver since Supergirl’s specialty is optimism and fun.